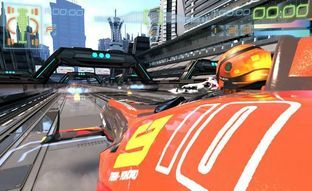 Formula Fusion is a racing game very similar to Wipeout series and it’s being developed by R8 Games, a team consisting of former Psygnosis members, hs released a new “trailer” introducing the new game “Formula Fusion”. The game is coming first to PC, and later to consoles. The trailer calls the game SlamJet Racing , but the name has been changed to Formula Fusion. The trailer didn’t have a good feedback, looks like most of the people was waiting something better coming from the Wipeout devs. Personally I liked, but could be better like a “trailer”.